XXXHOLiC Rei is available for purchase at CD Japan with worldwide shipping. We see the return of Yuuko and a very important (?) and mysterious item makes yet another appearance: the egg. CLAMP is telling us all that they haven’t forgotten about it. It’s clear now that the reason XXXHOLiC Rei was under hiatus for so long is because it was waiting for certain events to take place in Tsubasa. This seems like an important chapter with important dialogs. 12 pages again for this chapter — 122 pages so far for volume 4. Next chapter will be out on March 28. By then, Nirai Kanai hen will have ended and maybe XXXHOLiC Rei’s pacing will run faster? >It’s clear now that the reason XXXHOLiC Rei was under hiatus for so long is because it was waiting for certain events to take place in Tsubasa. I did feel that when reading the chapter, too. Cool! Can you make a quick summary? I’m not sure if it’s a summary as I’m mostly just translating Chinese to English. Watanuki asking Yuuko if that’s Syaoran’s wish to meet another Syaoran, just as he wanting to meet Yuuko in another dimension. And he’s wondering if what he gave was helpful (I’m guessing it’s the rabbit doll in ch.18 of Tsubasa). Watanuki then got by the water that Sakura and the princess released (to save Syaoran). He woke up to see Doumeki beside him. He told him about the girls, then Doumeki asked if that’s the only thing he saw in the dream. Watanuki said he saw Yuuko, too, though she doesn’t speak at all (“she’s definitely Yuuko”). Mokona said he was able to contact with others (meaning Tsubasa gang are out of the world that connection works again), and that they went through a lot. Mokona then said that goes the same for Watanuki, right, and Doumeki told him that he saw Yuuko. It seems like the time to use the egg is near as Doumeki talks by himself about if he would be using if that time comes, which he’s aware. If he would make it, asked Doumeki. *Translating Chinese to English in summary form. Thank you very much for the summary! I will still be extra nice to CLAMP and give them the opportunity to do better after TWC ends: let’s see what they do with the xxxholic series starting the end of March! I’m glad the “summary/quick translation/ w. my thoughts or guesses in regard to the relations with Tsubasa (in relations to “why the chapter release hiatus was intended”)” (I just realized how I should describe what I did) is helpful. 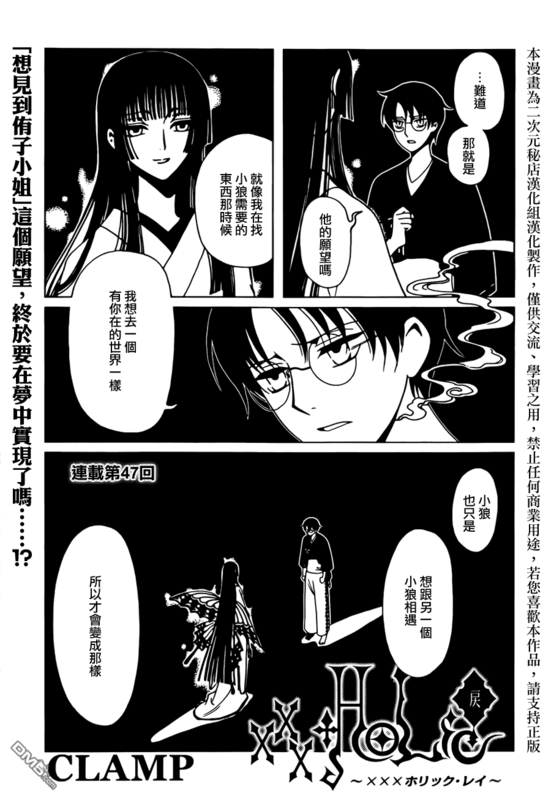 love watanuki and yuuko! my two favourite characters. but honestly 12 pages is no way enough for monthly release. it makes it slow. saying that i thought this chapter was pretty decent action wise. and the tsubasa and holic connections appear to be more seamless this time round… so far anyway. last time it got random and confusing as hell. that egg still wasn’t used at holics end finish. it was in the possession of doumeki 2/3 times junior. is it in case watanuki goes fei wang with yuuko? or maybe in case he makes the same wish clow reed did? clow reed and watanuki are very similar.